When we last saw Outlander, Scottish soulmates Claire and Jamie had been separated by time and space: Jaime was stuck fighting a war in the 18th century, while Claire was thrown back to the 1940s. 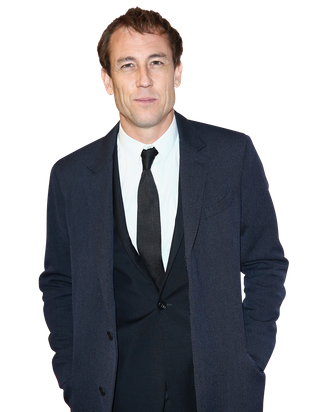 But where was Claire’s first husband, the sensitive Frank Randall, played by the U.K.’s hardest working actor, Tobias Menzies? The season-two finale reunited Frank and a pregnant Claire after he spent years searching for his missing wife. In the season-three premiere, the couple is headed to Boston for a fresh start for both the new baby and their marriage. Will their frosty relationship thaw? Will they happily settle into their new American life? We caught up with Menzies and fellow cast members Sam Heughan and Caitriona Balfe at San Diego Comic Con to talk about the season’s emotional premiere, Claire and Frank’s reunion, and what’s next for the Randalls in Boston. I cried several times throughout the episode. Tobias, in that last scene, that last shot on Frank was so powerful. Can you talk about how you got into character as Frank this season? What’s going on in his head at this moment in his emotional journey? Tobias Menzies: We pick up in Boston with them trying to rebuild. Claire and him are trying to rebuild their life, and it’s all about the arrival of this new baby, and the baby isn’t his, but he definitely instantly falls in love with this new child. And this new child, I think, brings sort of hope for them, and they think maybe they can make it. Maybe there’s something new to not make it a foregone conclusion. Maybe this could be the start that they’ve been needing. But, as always with Outlander, it never quite goes to plan. We were very much wanting to make that marriage full and real and heartfelt, and full of soul — which I think it is. They’re both two people, two good people, who are trying but missing each other. In that moment at the end, are those happy or sad tears? TM: With the child? I think it’s a tear of hope. Hope, after being through so much. Caitriona Balfe: [Pretends to open a box] From my box of tears … which one? Ah yes, hope. Sam Heughan: I thought it was dismay, oh no. CB: Picked up the wrong one. Oh no! TM: It’s a dismay tear, this is wrong! No, I think absolutely he loves the bones of Claire and this child. Even though it’s not his, I think it’s entirely meant and felt, and even with that little twist at the end of the nurse’s comment about the color of the hair. Yeah, this is definitely, I think, a new start for them in them. SH: There’s not enough ginger? CB: That was an anti-ginger tear. SH: He’s not a fan of the ginger. TM: He just really hates gingers! I’m so rooting for Frank. With your portrayal, are you trying to maybe shift fan allegiances? Because I was very Team Frank at the end of this episode. TM: Aww, that’s nice to hear. I mean, to be totally honest with you, we can’t really approach it like that. You just have to serve the story the best we can. I think to make Frank as 3D as possible is definitely the best thing for the books and for the story, and makes the story more interesting, makes it more complicated for that weird love triangle at the heart of the story. But listen: Any convert is great to hear, so I’m glad you felt Team Frank.